When I started this blog, one of the items on my list of goals was to increase the awareness of chefs and the many great recipes they create and, of course, the wines these chefs pair with them. Secondly I wanted to create a library of recipes for everyone’s enjoyment. During discussions on this concept with my daughter and wine partner, Elizabeth Carris, we came up with a partial list of chefs to profile. One of the chefs on the list was a high school pal of Elizabeth’s: Brian Steinway (they were in Drivers Education class together. What a scary thought: the two of them behind the wheel at age 16). What follows is Elizabeth’s profile of Chef Steinway. Whether he’s ramping up for a wedding reception, listening to up-tempo music in the kitchen or preparing meals for the after-church crowd on a Sunday morning, Executive Chef Brian Steinway of Christiana Creek Country Club stands behind his philosophy of offering an experience of unique tastes and flavors that leave his guests feeling satisfied; all at a price point that is just as satisfying. 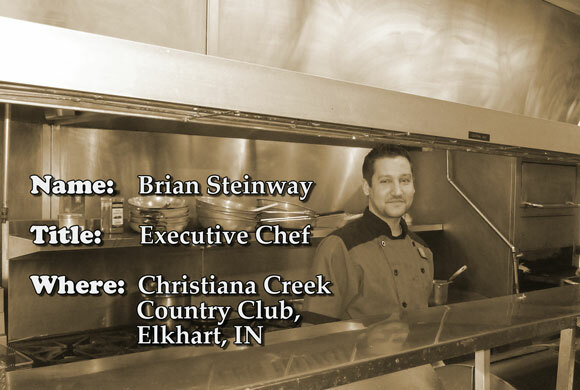 The Grill Room, which opened in the early 1990s at Elkhart’s Christiana Creek Country Club, is where Chef Steinway serves guests his distinctive Midwestern/American contemporary cuisine including fresh seafood and steaks with French and Italian flair. Steinway studied at the Cooking and Hospitality Institute of Chicago and has been at Christiana Creek Country Club since 2007. His signature dishes include a newly added appetizer of Beef Wellington Bites with Foie Gras, the Port Wine Duxelles (mushrooms) and White Truffle Oil, and an entrée of Seared Sea Scallops served on Risotto Cakes draped with Lobster Butter. His menu changes twice a year (in the fall and spring) and he tries to source local ingredients when he can. Chef Steinway takes the enjoyment of his members very seriously and tries to accommodate them as much as possible with the food and the wine menu. “Being a private club with over 600 people, guests know what they like and they seem to stick to it,” Steinway says. “So once they like something on the menu, it will stay put so they continue to have that option. The most popular dish on the menu is Pistachio Parmesan Salmon. Wine is not a primary component of the restaurant, but it is important to Steinway who chooses the wines on the Christiana Creek Country Club wine list. “I want great bottles of wine on the list at a fair price and we are one of the only places that has lower-than-industry mark-ups on wine so members get to experience them,” he states. The wines are chosen because they taste good, not necessarily to pair with the food, though they do compliment the dishes he serves. The wine list changes as new wine trends evolve and vintages change. And most of the wines on his list are rated wines. He also takes his members’ palates into consideration when choosing wines. “It’s important to know your members and know what they like. I like to make sure they have what they like and that they get a great wine at a good value,” he states. Wine training for his staff is pretty much one-on-one. Executive Chef Steinway shows culinary talent through signature dishes, a fair valued wine list of great wines and compassion for his members. 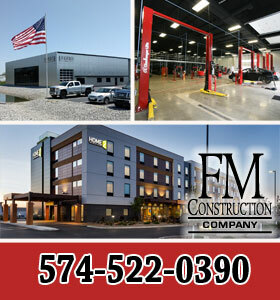 If you are in the area, visit him and his staff. Combine cheese, Panko bread crumbs and pistachios in food processor and grind until breading consistency. Make sure salmon has all bones removed. Brush salmon with butter or olive oil and top with Pistachio breading. Drizzle butter over breading and place in oven. Bake at 400F for 10-15 minutes depending on desired doneness and size of salmon filets. Sauté the shallot in the olive oil until it becomes soft, about 1½ minutes. Add the white wine and bring to a boil. Boil for three to five minutes, until it is reduced by half. Strain the shallot from the wine, and return the wine to the pan. Add the butter to the white wine reduction, and cook over medium low heat until the butter melts; remove from heat. Whisk in the lemon peel, lemon juice and parsley. Set aside and keep warm until ready to pour over finished salmon filets. Great Article! I look forward to reading this blog in the future! Laura. Thank you for your comments and subscribing to the Tiedemann on Wines blog.